Possible role of membrane gamma-glutamyltransferase activity in the facilitation of transferrin-dependent and -independent iron uptake by cancer cells. The molecular mechanisms by which iron is physiologically transported trough the cellular membranes are still only partially understood. Several studies indicate that a reduction step of ferric iron to ferrous is necessary, both in the case of transferrin-mediated and transferrin-independent iron uptake. Recent studies from our laboratory described gamma-glutamyltransferase activity (GGT) as a factor capable to effect iron reduction in the cell microenvironment. GGT is located on the outer aspect of plasma membrane of most cell types, and is often expressed at high levels in malignant tumors and their metastases. The present study was aimed at verifying the possibility that GGT-mediated iron reduction may participate in the process of cellular iron uptake. Four distinct human tumor cell lines, exhibiting different levels of GGT activity, were studied. The uptake of transferrin-bound iron was investigated by using 55Fe-loaded transferrin, as well as by monitoring fluorimetrically the intracellular iron levels in calcein-preloaded cells. Transferrin-independent iron uptake was investigated using 55Fe complexed by nitrilotriacetic acid (55Fe-NTA complex). The stimulation of GGT activity, by administration to cells of the substrates glutathione and glycyl-glycine, was generally reflected in a facilitation of transferrin-bound iron uptake. The extent of such facilitation was correlated with the intrinsic levels of the enzyme present in each cell line. Accordingly, inhibition of GGT activity by means of two independent inhibitors, acivicin and serine/boric acid complex, resulted in a decreased uptake of transferrin-bound iron. With Fe-NTA complex, the inhibitory effect – but not the stimulatory one – was also observed. It is concluded that membrane GGT can represent a facilitating factor in iron uptake by GGT-expressing cancer cells, thus providing them with a selective growth advantage over clones that do not possess the enzyme. Iron is involved in several primary cellular functions – such as DNA synthesis, ATP generation, electron transfers, oxidation of substrates – and is therefore an essential factor for cell survival and replication [reviewed in ]. On the other hand, iron may also catalyze oxidation-reduction (redox) reactions, leading to the production of free radicals and potentially noxious oxidative stress. As a consequence, living organisms developed strictly regulated processes for iron transport, uptake and storage, and a balance between these mechanisms is essential for life . In aqueous, non-acidic environments, iron exists in highly insoluble polymeric forms. Consequently, cells had to devise specific strategies to solubilize and absorb the metal. These include i) systems capable to effect the reduction of ferric ions to the more soluble ferrous form, and ii) the use of proteins capable to transport ferric iron as such, such as e.g. transferrins . The main pathway for iron uptake by animal cells is through the plasmatic protein iron carrier, transferrin (Tf), and its specific receptor (TfR) located at the cell surface. Following the ligand binding, the Tf/TfR complex is internalized by a receptor-mediated endocytosis and iron is released by a process involving endosomal acidification through an influx of protons through an ATP-dependent proton pump [4, 5]. Other studies have suggested that another critical step in cellular uptake of Tf-bound iron may be the reduction of ferric iron to ferrous , and several molecular species acting as reductants have been described, including the superoxide anion, ascorbic acid and thiol compounds . However, the role of these processes in iron uptake from Tf remains controversial and still subject to debate. As recently pointed out by Kwok et al., lines of evidence suggest that Fe3+ reduction takes place after uptake, as Fe is released from endosomes into the cytosol. Besides Tf-bound iron, animal cells can also obtain iron from small, non-protein, low molecular weight complexes. Such complexes can originate in conditions such as iron overload when the binding capacity of transferrin is saturated and free, "non-Tf-bound iron" (NTBI) is generated . Interestingly, the involvement of free radical reactions in the uptake of NTBI has also been recently proposed . Altogether, the precise molecular mechanisms by which iron is physiologically unloaded from its complexes and transported trough the cellular membranes in eukariotic cells are still in need of elucidation. With respect to the possibility that a reduction of Fe3+ to Fe2+ may represent a critical step in the process, thiol (-SH) compounds are known to reduce iron efficiently . Such iron-reducing ability can be demonstrated for several molecules, including the well-known antioxidant tripeptide glutathione (gamma-glu-cys-gly; GSH) . GSH – one of the main cellular antioxidants – as such cannot cross plasma membrane of most cell types, and thus the recovery of extracellular GSH is warranted by membrane gamma-glutamyl transpeptidase (GGT), an ecto-enzyme with the active site oriented toward the outer cell surface. GGT is capable to start the catabolism of extracellular GSH, and as in most cell types a continuous efflux of GSH to the extracellular space exists, in cells expressing GGT at their surface a continuous "GSH cycling" across the plasma membrane therefore occurs . Recent studies of our and other laboratories have highlighted the role that GGT activity can play in the redox regulation of cellular functions, isofar as the GGT-mediated cleavage of GSH gives rise to the thiol dipeptide cysteinyl-glycine, whose -SH group is much more reactive than the one of GSH , and is provided in particular with a much stronger iron-reducing ability [15, 11]. Against this background, the present study was aimed to investigate if GGT activity could represent a mechanism for the reduction of iron, capable to interfere favourably with its uptake by the cell. GGT activity is elevated in a number of human primary as well as metastatic tumors, such as e.g. ovary , colon , lung , liver , prostate , sarcoma , melanoma , leukemias , especially in their metastatic forms. In a series of 60 different human tumor cell lines, GGT was significantly expressed in 70% of cases . GGT-mediated iron reduction may thus represent a widespread characteristic of malignant cells. It is well established that the generally higher iron uptake by cancer cells is often the result of a higher number of transferrin receptors . The iron-reducing effect of membrane GGT activity may play an additional role in iron supply of malignant cells, thus contributing to support the role of iron in carcinogenesis which a number of studies has highlighted [reviewed in ]. Figure 1 shows the results of 55Fe-Tf uptake in the different neoplastic cell lines studied. In U937 cells (Fig. 1A), GGT stimulation with the substrates GSH and glycyl-glycine significantly increased Tf-mediated 55Fe uptake. A small but significant increase in iron uptake was also observed in cells treated with glycyl-glycine alone. Conversely, in cells pretreated with the irreversible, non-competitive inhibitor acivicin, a significant decrease in 55Fe uptake was observed, both in control cells and in cells stimulated with GSH and glycyl-glycine. As a confirmation of the inhibitory effect of acivicin, the same effect was observed in cells after GGT inhibition by the structurally independent, competitive inhibitor SBC. Efficacy and specificity of GGT inhibition by acivicin and by SBC was thoroughly assessed in earlier studies by A. Meister's group [26, 27]. A similar pattern of response was observed in GGT-rich Me665/2/60 cells (Fig. 1B). Again, GGT stimulation significantly increased Tf-mediated 55Fe uptake, and a small effect of glycyl-glycine alone was also present. GGT inhibition experiments resulted in significant inhibition of iron uptake in the case of SBC treatment. In K562 cells (Fig. 1C) expressing a lower GGT activity, an insignificant increase in 55Fe-Tf uptake was observed after GGT stimulation. On the other hand, GGT inhibition with acivicin resulted in inhibition of iron uptake, which was significant in the case of GGT stimulated cells. In Me665/2/21 cells, possessing only traces of GGT activity, no significant effects of GGT modulation on iron uptake was observed (Fig. 1D). A plot of cellular GGT activity levels against the corresponding extents of increase in Tf-iron uptake observed in each cell line after GGT stimulation is reported in Fig. 2. A significant logarithmic correlation was present between the two sets of values. 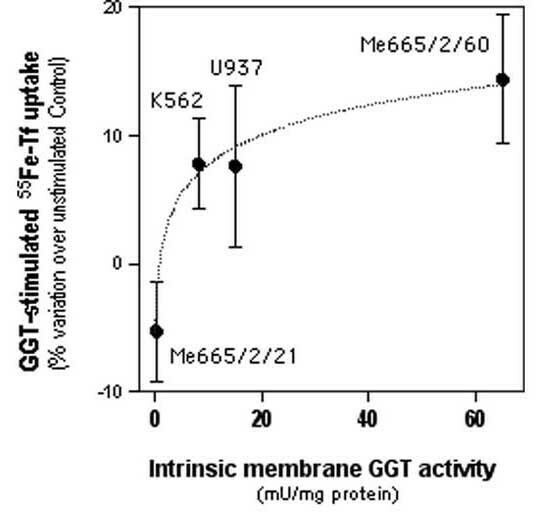 Effects of modulation of membrane GGT activity on transferrin-mediated uptake of 55 Fe by 4 human cancer cell lines expressing different levels of GGT activity. Data shown are means ± SEM of 2–5 experiments. Panel A: U937 histiocytoma cells (*significantly different from control value, P < 0.05; **significantly different from the "+GSH+gly-gly" value, P < 0.05). Panel B: Me665/2/60 melanoma cells (*significantly different from control value, P < 0.05). Panel C: K562 erythroleukemia cells (**significantly different from the "+GSH+gly-gly" value, P < 0.05). Panel D: Me665/2/21 melanoma cells (differences not statistically significant). Correlation between membrane GGT activity of 4 human tumor cell lines and the corresponding GGT-stimulatable uptake of transferrin-bound iron. Data shown are means ± SEM of 3–5 experiments. The logarithmic correlation curve shown is statistically significant (r = 0.99). The observed facilitating effects of GGT activity on 55Fe-Tf uptake was verified with K562 cells in different experimental conditions, by analyzing the iron-induced quenching of intracellular fluorescence of calcein-preloaded cells. 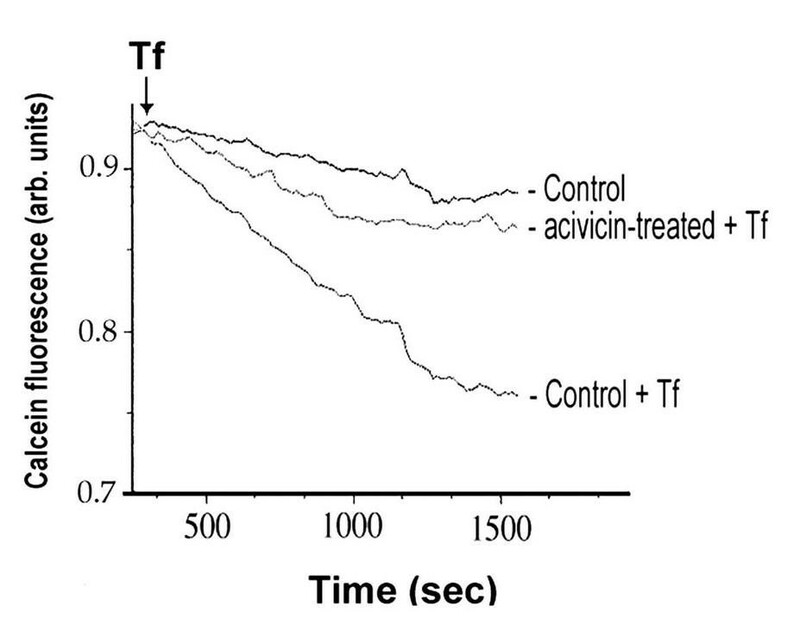 Fluorescence decrease induced by administration of iron-loaded transferrin was largely prevented in cells whose GGT activity had been irreversibly inhibited by acivicin (Fig. 3). On the other hand the stimulation of GGT activity with this methodology did not result in appreciable stimulation of Tf uptake, suggesting that GGT-dependent Fe uptake may already be maximal in these cells. Effects of GGT inhibition on transferrin-bound iron uptake in K562 cells. Online fluorimetric monitoring of intracellular iron levels. Transferrin (>70% iron-saturated) was added where indicated, and the decrease in fluorescence of intracellular calcein was recorded (cfr. Methods for details of the procedure). One representative experiment out of five is reported. Experiments with Fe-NTA were carried out with the two cell lines with higher GGT activity, U937 and Me665/2/60 cells. As can be seen in Fig. 4, no significant effect of GGT stimulation was observed, while GGT inhibition with the competitive inhibitor SBC did produce a significant inhibition of non-Tf-bound iron uptake in both lines. 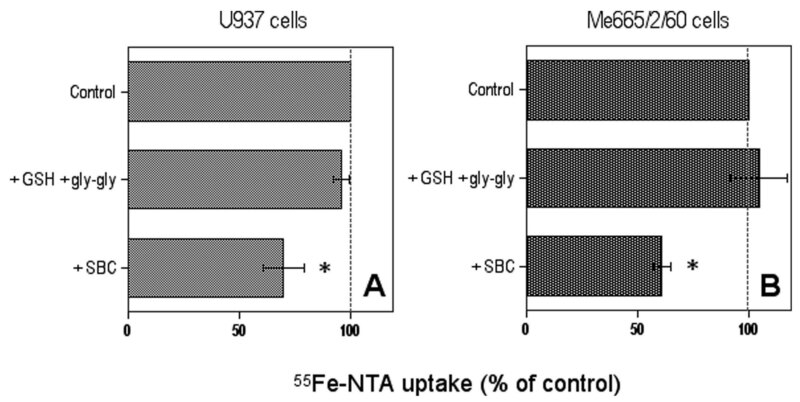 Effects of modulation of membrane GGT activity on the uptake of 55 Fe-nitrilotriacetate complex by GGT-rich U937 (A) and Me665/2/60 cells (B). Data shown are means ± SEM of 3–5 experiments. * Significantly different from control value, P < 0.05. The -SH group of the dipeptide cysteinyl-glycine in fact is much more reactive than the one of GSH , and is provided in particular with a much stronger iron-reducing ability [15, 11]. Interestingly, the fact that the inhibitory effects of acivicin and SBC were observed both in GGT-stimulated and in control cells indicates that GGT activity is capable to effect a facilitation of 55Fe-Tf uptake even in basal, unstimulated conditions. Indeed, previous work has documented that U937  and Me665/2/60 cells , like many other cell types, present with a continuous efflux of GSH, which is continuously recovered by cells through its extracellular catabolism by membrane GGT activity. The fact that stimulation of GGT by glycyl-glycine alone also induced a significant stimulation of iron uptake indeed confirms that sufficient GSH was available to GGT activity, even in absence of exogenous addition. Thus, GGT activity appears capable to facilitate 55Fe-Tf uptake even under basal conditions. The lack of effect of GGT stimulation in Me665/2/21 cells – possessing only traces of GGT activity – actually provides sort of a 'negative control' for the phenomenon. In K562 cells, possessing low GGT levels, the facilitation effect of GGT stimulation on 55Fe-Tf uptake was not significant; however pretreatment with GGT inhibitor acivicin prior to addition of GGT substrates reduced Fe uptake significantly. A facilitating role of GGT in K562 cells could also be demonstrated by means of an alternative methodology, i.e. fluorimetric determination of intracellular iron levels (Fig. 3). 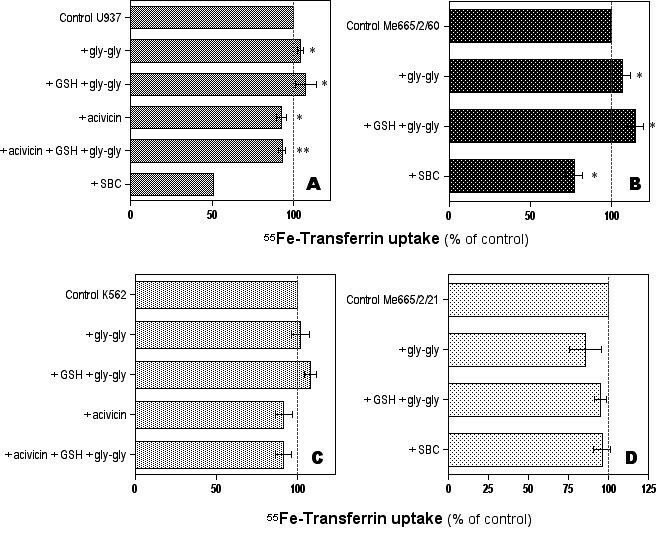 In these experiments, the mere inhibition of GGT resulted in a marked inhibition of Tf-iron uptake, again pointing to a role of basal GGT activity in iron uptake. Altogether, the data obtained with the three GGT-positive tumor cell lines indicate that a facilitation effect is already present at relatively low levels of GGT activity (5–10 mU/mg protein), while much higher GGT levels, such as those in Me665/2/60 cells, do not correspond to comparably higher facilitating effects (Fig. 2). With respect to non-Tf-bound uptake, GGT stimulation did not appear to produce any significant effects, at least in the two lines tested (U937 and Me665/2/60 cells), while a marked inhibition of iron uptake was observed in both lines following GGT inhibition by SBC. This finding suggests that a facilitatory role of GGT on non-Tf-bound iron uptake exists, but is already maximal under conditions of basal GGT activity, and cannot be further stimulated. The findings suggest that membrane GGT activity can exert a facilitating effect on iron uptake, potentially representing an additional mechanism for iron supply in cancer cells presenting with up-regulated levels of this enzyme. This effect is probably mediated through redox interactions of GGT-derived reactive thiols and/or prooxidant species, although further studies are needed to determine the precise mechanism(s) involved. Studies of experimental carcinogenesis evidenced GGT expression as a marker of tumor progression [31, 32], and – as mentioned above – a number of human malignancies express GGT at medium-high levels. Iron is an important nutrient for actively proliferating neoplastic cells. As the expression of GGT is highly inhomogeneous among cell clones belonging to the same tumor [20, 33], it is conceivable that the additional gain in iron uptake allowed by GGT – although of limited extent – may confer GGT-rich clones with a growth advantage over GGT-poor ones, thus helping to explain the higher levels of GGT usually detectable in late stage and metastatic malignancies. Four human tumor cell lines, displaying different membrane GGT activities, were used. GGT activity was assayed with the method of Sze et al. , involving the spectrophotometric measurement of p-nitroaniline released from the substrate gamma-glutamyl p-nitroanilide (GPNA). One unit of GGT activity was defined as the amount of the enzyme capable to release 1 μmol p-nitroanilide/min from the substrate GPNA . U937 histiocytoma cells and Me665/2/60 melanoma cells were provided with medium-high GGT activity (≅15 and ≅65 mU GGT/mg protein, respectively), while GGT levels were lower (≅8 mU/mg protein) in K562 erythroleukemia cells, and virtually absent (≅0.2 mU/mg protein) in Me665/2/21 melanoma cells. All lines were routinely cultured in RPMI 1640 medium, containing 10% heat-inactivated fetal calf serum (FCS), 2 mM L-glutamine, 0.25 μg/ml amphotericin B and 50 μg/ml gentamycin), at 37°C, under 95% air : 5 % CO2 in a humidified atmosphere. For stimulation of cellular GGT activity, cell lines were incubated in the presence of the substrate, GSH (200 μM), and the co-substrate glycyl-glycine (2 mM) serving as the acceptor of gamma-glutamyl moieties for the transpeptidation reaction . Inhibition of GGT was obtained by exposing cells to the non-competitive inhibitor acivicin (130 μM), for 4 h prior to experiments, or alternatively, by performing experiments in the presence of the specific competitive inhibitor serine/boric acid complex (SBC), 10/10 mM . The procedure of Klausner et al. , with slight modifications, was used. 55FeCl3, 0.4 mCi (NEN Life Sci. Products, Boston, USA), was complexed to nitrilo-triacetic acid (NTA; Sigma, S.Louis, USA) at a ratio of 0.18 μmol Fe : 1.8 μmol NTA, followed by the addition of 0.045 μmol of human apo-transferrin (Sigma) dissolved in 1 M Tris-HCl, 2 mM NaHCO3 buffer, pH 8.5. 55Fe-Tf was separated from non-bound 55Fe by gel-filtration on a PD-10 column (Amersham Biosciences, Italy) pre-equilibrated with buffer. U937 and K562 cells were seeded at 2 × 105 /ml, while Me665/2/60 and Me665/2/21 cells were seeded at 2 × 104/cm2. After 24 h, cells were incubated in RPMI containing BSA 0.1%, at 37°C for 45 min, in order to allow the detachment of bovine Tf contained in FCS . After changing the medium with fresh RPMI/BSA 0.1%, 4 μl/ml of the 55Fe-Tf solution were added to cell cultures and the incubations were prolonged at 37°C for 2.5 h. Control samples were mantained at 4°C, i.e. in conditions that prevent cells to absorb the metal, or alternatively 55Fe-Tf was added immediately before washes (t 0); the latter samples indicated the aspecific binding of radioactivity to cells, and their values were substracted from the results. At the end of the incubations, samples were washed 3 times with Hepes-buffered saline (pH 7.4), resuspended in 200 μl, and counted in a scintillation beta-counter (Canberra Packard, Australia). Further experiments were carried out with the low molecular weight complex, iron nitrilo-triacetate (Fe-NTA). To cells pre-treated for either GGT stimulation or inhibition, a loading solution (400 mM NTA plus 100 mM FeCl3, containing 1% (vol/vol) of a stock 55FeCl3 solution (107 cpm/ml) was added, and incubations were prolonged for 45 min at 37°C (or at 4°C = controls for non-specific 55Fe absorption). At the end of incubations, cells were washed 3 times in ice-cold Hepes-buffered saline, resuspended in 200 μl of 5% trichloracetic acid and left on ice for 20 min. After centrifugation (17,000 g, 15 min), aliquots of the supernatants were withdrawn and counted in the scintillation beta-counter. The method of Cabantchik et al. was used. Briefly, K562 cells (1 × 106/ml) were pre-incubated with 0.25 μM calcein acetoxymethyl ester (CAM; Molecular Probes, Eugene, USA) in serum-free MEM medium containing 1 mg/ml BSA and 20 mM Hepes (pH 7.3), washed of excess CAM and resuspended in fresh medium. For determinations, aliquots of cell suspensions were transferred to a stirred, thermostatted cuvette, transferrin (>70% iron-saturated; Kama-Da Industries, Israel) was added (100 μg/ml), and fluorescence was monitored at an excitation of 488 nm and an emission of 517 nm using a PTI fluorescence station (PTI, South Brunswick, USA). Statistic evaluation of data was performed by means of ANOVA test, and results with probability P < 0.05 were considered as significant. The invaluable supervision of Dr. Z.Ioav Cabantchik (The Hebrew University, Jerusalem) in performing the calcein experiments is gratefully acknowledged. This work was supported by the Associazione Italiana per la Ricerca sul Cancro (A.I.R.C., Italy), and the Italian Ministry for Education, University and Research ('F.I.R.B.2002' funds). S. Dominici was the recipient of an I.C.R.E.T.T. grant from the Union Internationale Contre le Cancer (U.I.C.C.). Author S.D. performed all iron uptake experiments and participated in the interpretation of results. Author L.P. carried out all cell culture work and participated in part of the non-transferrin bound iron uptake experiments. Author M.C. participated in the design of the study and preparation of manuscript. Author A.P. conceived the study, participated in its design and coordination, and carried out the statistical analysis of data.